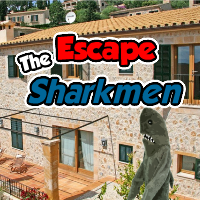 Selfdefiant - Escape The Sharkmen is another point and click escape game created by Selfdefiant for Melting-Mindz and Yizzim. Sneaky was caught by the sharkmen and now he needs your help escaping! Look around and see what you can find to help escape! Good luck and have fun! Uh, a shark game. Count me in! Sneaky in pool scene in a window. Orange gemstone in K, in hammock. mariagrazia, i'm still searching for the last egg. nom, have you found the one in the microwave? Yes, i have. I also found the one on the pillar with the hammock. And two that were in plain sight. Oh, found it. It was in N under the bank. Can't figure out the order of the symbols from the park bench for the briefcase in H.
Use shovel for big rock in P.
Kias, it's in the paper with coloured letters. Kias, hint is under krashs. What to do with sd? sd is used in bathroom next to the start scene. Found it. In A is an airvent. thanks Nomnivor for sneaky coin hint! Is there a lighter for the candles? My oven does not want to ! Same place as Blooby. No purple gem. Castle, jellyfish numbers are used somewhere else. Think 24 hour time. Is SharkMan the evil twin of Marko Sharko? !!! 4 @@@@ ### 1 @@@@@ 6 **** 1 % $ # 9! SPOILER oven ! I'm still looking for the blue key. Thanks for a great game SD. I was relieved to see that the sharkman is only sleeping! One of the better SSSG games in a while. Nice game SD! I guess I'm the last player, with a day delayed but it was fun! pdgph - the goggles were in P. Click the background and you'll find them under a rock. And, Doris, no I just played it too so you're not last.